Make the most of your trip with the Petronas Twin Towers and Aquaria KLCC combo tickets! Worth the price. Though we realized that when you exit the walkalator there's no more going back inside. 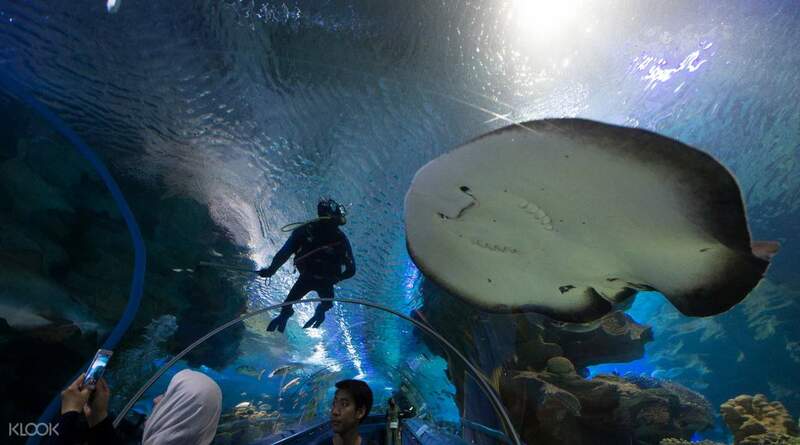 Discover Malaysia’s thriving marine life at the Aquaria Kuala Lumpur City Center, just a ten minute walk away from the famed Petronas Twin Towers. 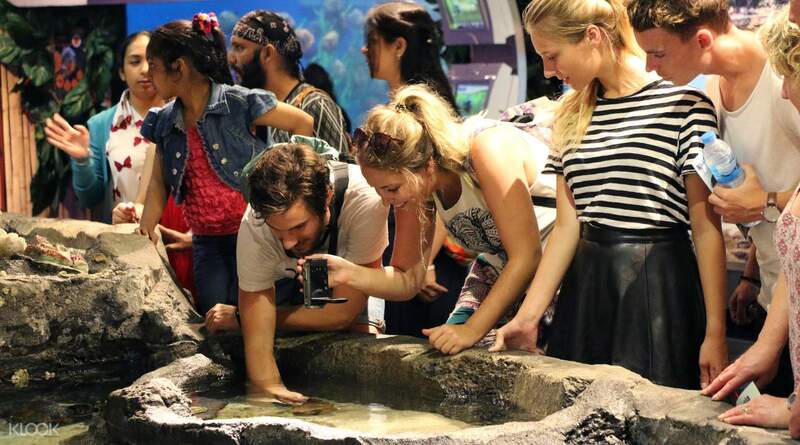 With over 5,000 exhibits of underwater and land creatures to choose from, the vast aquarium offers a day of exciting activities for everyone. Journey through the 90 meter transparent underwater tunnel where hundreds of fishes, sharks, stingrays, and more surround you from everywhere you look. Witness the sea animals in their natural habitat and get the chance to interact with starfish and sea cucumbers at the Gene Pool. 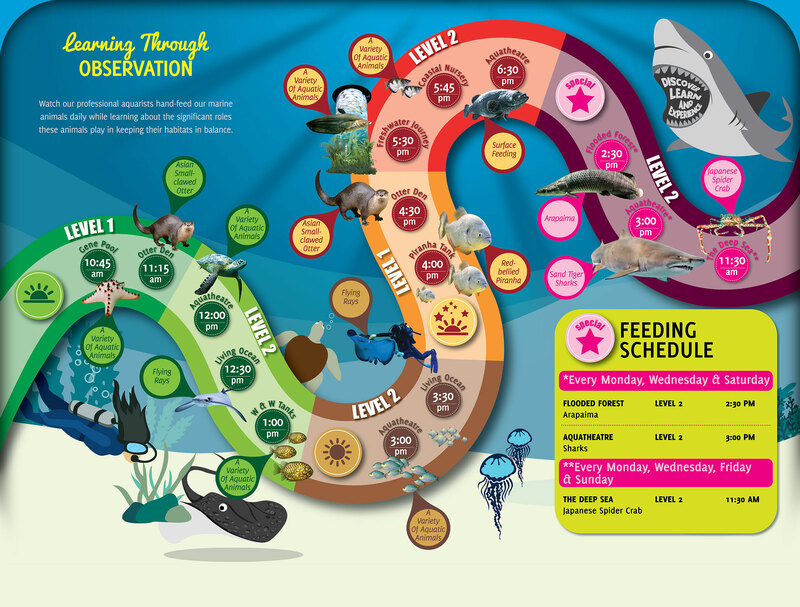 Don’t miss out on the signature feeding shows scheduled throughout the day, where professional staff members will tell you all about the feeding habits of the hungry sea creatures. 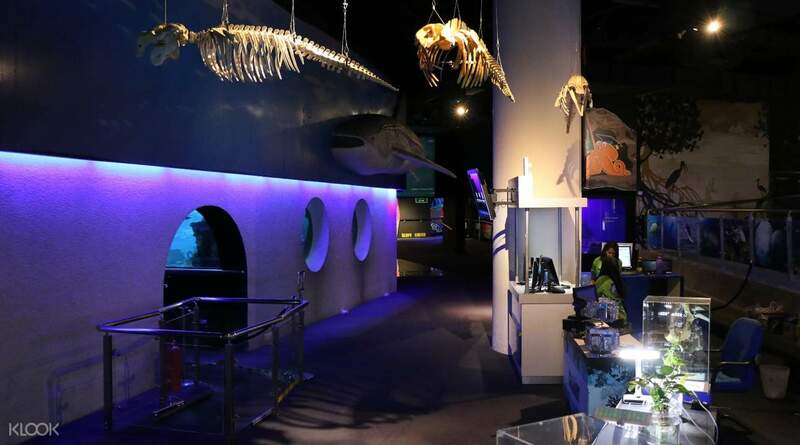 Between immersive coral exhibits and thrilling nocturnal adventures, Aquaria KLCC will surely leave you with a newfound appreciation of life under the sea. 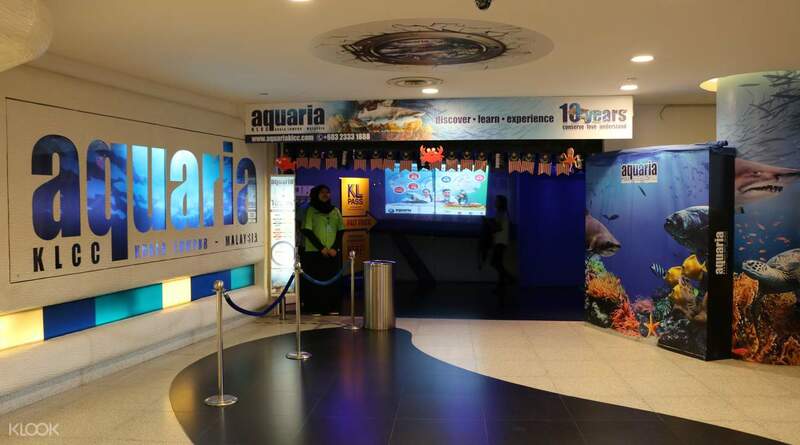 Get your Aquaria Kuala Lumpur ticket from Klook and enjoy discounts! The best experience I’ve ever had. Going there for an oceanarium date with my girlfriend, and we’re both having fun exploring and getting to know new habitats of both marine and freshwater creatures. The best part of this adventure is when we’re under the tunnel to get experience firsthand of seeing sharks up close and enormous turtles swimming around. We’re both definitely will come again in future to see otters and other exciting and uniques life marines and freshwaters. The best experience I’ve ever had. 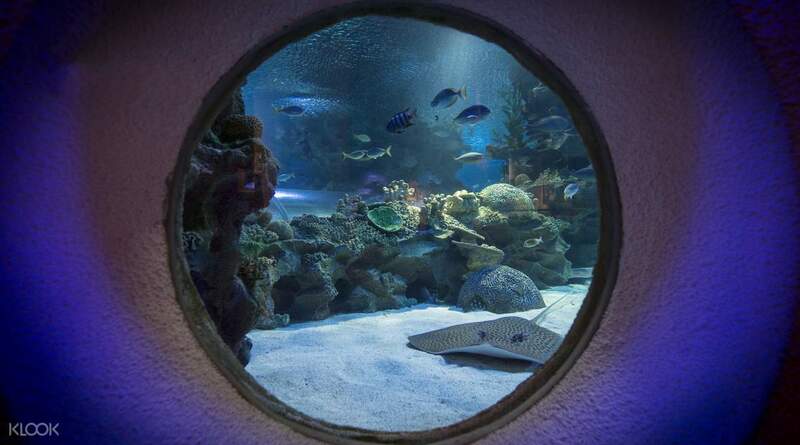 Going there for an oceanarium date with my girlfriend, and we’re both having fun exploring and getting to know new habitats of both marine and freshwater creatures. The best part of this adventure is when we’re under the tunnel to get experience firsthand of seeing sharks up close and enormous turtles swimming around. We’re both definitely will come again in future to see otters and other exciting and uniques life marines and freshwaters. Easy access using klooks apps it's fast and cheap to buy tickets. The price is only RM 35 for adults compare to counter price. Most recommended. My kid was so happy visiting Aquaria KLCC we feel like we are under the big sea although we feel hot under the shark thank. Overall is good. Easy access using klooks apps it's fast and cheap to buy tickets. The price is only RM 35 for adults compare to counter price. Most recommended. My kid was so happy visiting Aquaria KLCC we feel like we are under the big sea although we feel hot under the shark thank. Overall is good. An informative place for all ages! Great for those who'd like to learn more about the underwater life but hasn't got the chance to experience scuba diving or snorkeling. This is the safest way yo do so without fear of your oxygen tank running out of air 😉 I wish I was the diver working there. An informative place for all ages! Great for those who'd like to learn more about the underwater life but hasn't got the chance to experience scuba diving or snorkeling. This is the safest way yo do so without fear of your oxygen tank running out of air 😉 I wish I was the diver working there. My second time purchased this voucher through Klook. It is so easy to use and the redemption process also fast. Overall I am satisfied with this app. I will purchase more vouchers with Klook after this. The price are more cheaper than walk in price. Overall I am so happy with the service. Good job Klook. My second time purchased this voucher through Klook. It is so easy to use and the redemption process also fast. Overall I am satisfied with this app. I will purchase more vouchers with Klook after this. The price are more cheaper than walk in price. Overall I am so happy with the service. Good job Klook. Went to Aquaria at 10am, already too many people, maybe because school holiday. Booking on Klook makes its easier since you can skip the que and go straight to scan the code, prepare your IC since they will need to check it first. Really love the walk below shark tank, although its quiet hot in there with many people go inside at the same time. Went to Aquaria at 10am, already too many people, maybe because school holiday. Booking on Klook makes its easier since you can skip the que and go straight to scan the code, prepare your IC since they will need to check it first. Really love the walk below shark tank, although its quiet hot in there with many people go inside at the same time. Smooth access with Klook. Very recommended. It's a great experience for the kid. They are very happy and entertained with the real sea lives they saw in the book! The area is clean, well maintained and the staffs are very friendly. Smooth access with Klook. Very recommended. It's a great experience for the kid. They are very happy and entertained with the real sea lives they saw in the book! The area is clean, well maintained and the staffs are very friendly. My kids had so much fun. Puchased ticket with Klook is much more easier and cheaper. Need no que at alll. I went there on weekend, a bit traffic in moving tunnel . Overall, was awsome. Thank You KLOOK . My kids had so much fun. Puchased ticket with Klook is much more easier and cheaper. Need no que at alll. I went there on weekend, a bit traffic in moving tunnel . Overall, was awsome. Thank You KLOOK . With Klook, my cousin and I no need to queue up for buying the tickets just straight up to scan our tickets. In there, we feel like going to different world surrounding with many kind of sea creatures. Don’t forget to buy a souvenir before leaving ! There’s lot of choices. With Klook, my cousin and I no need to queue up for buying the tickets just straight up to scan our tickets. In there, we feel like going to different world surrounding with many kind of sea creatures. Don’t forget to buy a souvenir before leaving ! There’s lot of choices. I bought my ticket at Klook and it was a real deal. No hassle at the entry point, just verify with your official ID card or passport. Try to call catch the feeding times. That's when the marine and human hosts come together to give you an unforgettable experience. I bought my ticket at Klook and it was a real deal. No hassle at the entry point, just verify with your official ID card or passport. Try to call catch the feeding times. That's when the marine and human hosts come together to give you an unforgettable experience.